Exceptional accommodations for Southwest Montana. Our rustic cabins are located minutes from Bozeman, Montana. Each modern western styled cabin offers top related lodging with scenic views of the Bridgers and Spanish Peaks Mountain ranges at an affordable rate. If you fly fish, William's Bridge on the Gallatin River is 1.5 miles away. Next door at the Broken Hart Ranch, you can horseback ride or enjoy a chuck wagon cookout. If it is a spa or natural hot springs you need, Bozeman Hot Springs is 5 minutes from Canyon Cabins. Once in the Gallatin Canyon, there are dozens of trailheads to explore, white water rafting trips to take, excellent kayaking and many more scenic fly fishing spots. One entrance to Yellowstone National Park is 40 miles from Canyon Cabins. Access to Big Sky and Moonlight Basin Ski Resorts is 25 miles down the road. The Yellowstone Cabin was completed in January 2004. This one room cabin comes with a queen bed, twin bunk beds, large table, full kitchen, microwave, TV/VCR and a shower in the bathroom. The 320 Square foot covered deck, with views of the Spanish Peaks, makes this cabin special. The cozy Bunkhouse Cabins have two individual units in each building. Bunkhouse #1 and #2 share a porch with a view of the Spanish Peaks. Bunkhouse #3 and #4 have a view of the Bridgers. All of the log bunkhouse cabins have a kitchenette, TV, microwave, toaster, coffee maker and shower in the bathroom. Bunkhouse #1 and #3 have a queen bed. They each sleep 2 people. The Bunkhouse #2 has a queen bed along with a twin bunk bed. Bunkhouse #2 cabin sleeps 4. Bunkhouse #4 has a queen bed with a wooden bunk bed that has a full bed on the bottom and twin bed on the top. Bunkhouse #4 sleeps 5. 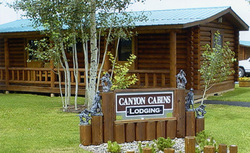 So, if you are looking for a base camp for your outdoor activity, come stay at Canyon Cabins. Directions: Canyon Cabins is located in the beautiful Gallatin Valley on US Highway 191 (14 miles from Bozeman and 65 miles from West Yellowstone - the west entrance to Yellowstone National Park).